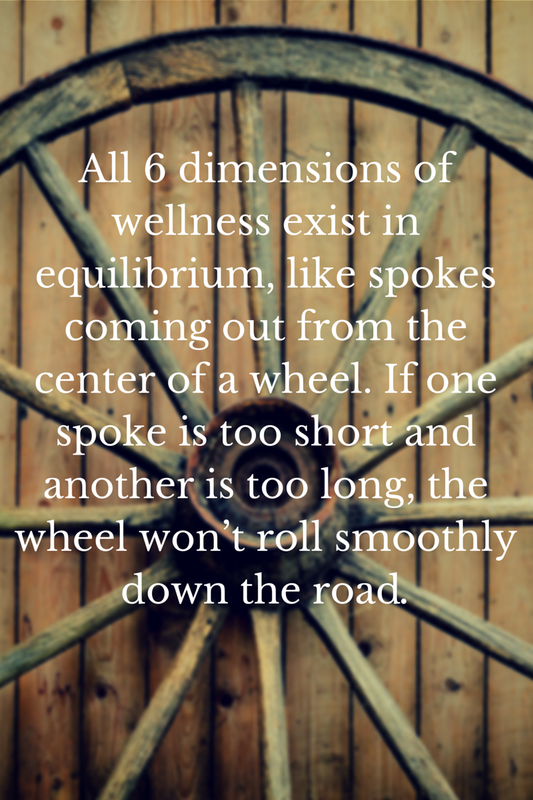 Wellness has six dimensions, and although this blog has so far provided more information about the physical dimension, the other five are just as important. While this sounds lovely, like butterflies, rainbows and flowers, it’s more than just idyllic. It’s a naturally occurring ebb and flow within our lives. Physical, emotional, social, occupational, intellectual, and spiritual wellness work concurrently to satisfy us. One is not more important than another. I was actually shocked to hear Pastor David Stine, a spiritual leader in the DC metro region, say that being overly focused on being spiritual, at the cost of our physical health (and/or other components of wellness), can become just as unhealthy for us as not being spiritual at all. Yes, it’s true. A faith leader actually said this. His congregation responded with cheers and gasps of surprise. This demonstrates the power of living in wellness. Take the following examples of people who are having a hard time growing and/or who are living one-dimensionally…Maybe you can relate to one of these?! Julie works incredibly hard as a consultant. Approximately several times a year she will go through a 4-6 week long period where she doesn’t sleep more than 5-6 hours each night and forgoes the gym to work extended hours at the office. She usually takes Saturday nights off during this time and likes to go out for a handful of strong cocktails with friends, anxious to let go of some tension. On Sundays, she wakes up tired but she slugs down some coffee and gets back to work. After the 4-6 week period is done, she goes into overdrive at the gym, to make up for not working out. Julie tries to put in 1.5-2 hours each workout during this time but usually quits the gym entirely after 2-3 weeks because work starts to get busy again. Martha has a stable job working for a tech company. She gets to work reasonable hours and can count on getting home to her family in time to cook dinner, put the kids to bed, and have a little personal time with her husband. Her family is financially comfortable and has a great network of neighbors and friends to keep them busy and happy. But, Martha just can’t understand why she feels so depressed since everything in her life seems picture perfect. The only thing she can think of is that she hasn’t been stimulated at work in over 3 years and can no longer imagine growing within her company. Every time she thinks about starting the job hunt she gets anxious but every time she looks around her office she feels underutilized. Last year, Brittany set a goal of losing 50 lbs because she was unhappy with her body. She went from hating the gym to waking up extra early to attend fitness classes and work out. A little over halfway through the year she has already surpassed her weight loss goal. She feels so empowered that she has decided to keep the ball rolling. She will try to lose another 25 lbs in the next three months even though she has reached a healthy weight. Her boyfriend has told her that she is beautiful how she is but every time Brittany hears this she rolls her eyes. She doesn’t want to go out for date nights anymore, fearing food at restaurants where she is unsure of the calorie count. Brittany’s friends also can’t convince her to go to brunch, or even to attend church together, because she says it will cut into her gym schedule. She has started arriving 15 minutes late to work because she wants to fit in extra cardio in the mornings and she often leaves work a little early to hit the gym again. Her boss notices that her job performance is deteriorating and her boyfriend is on the verge of breaking up with her. Do any of these women sound like someone you’ve known? Do any of them sound like you? I’m not saying we haven’t all “been there” because of course we have! We may have walked in similar shoes as Julie, Martha or Brittany, or our “wellness wheel” may have been dysfunctional due to other factors. Living in balance is NOT easy; however, living in balance is a worthy goal. If this seems challenging and elusive to you, you’re not alone. Pursuing self-improvement in each dimension at once is admirable but also darn near impossible. We’re never going to be “perfect” but we can definitely strive to improve and become self-aware. We can challenge ourselves to balance out work and life. We can work to grow spiritually while also becoming socially vibrant. We can juggle our emotional worlds even when they are juxtaposed to our mental realities. The desire to grow, even if it means a little back-sliding and upheaval, is the ultimate catalyst for achieving satisfaction in the deepest parts of ourselves. 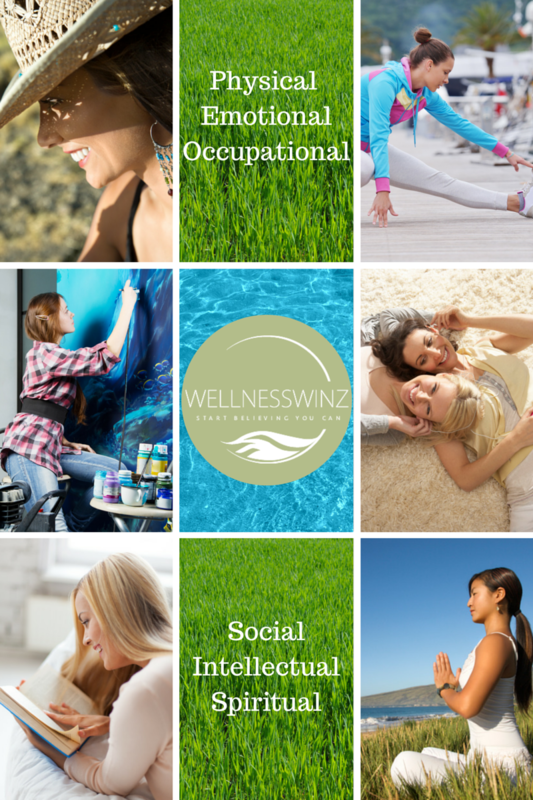 And so, we will season the content of this blog by sprinkling in wellness topics, interviews, and discussions. By touching on each of the six dimensions over time, we will grow ourselves and the women around us. I hope you’re as excited for the journey as I am. PS – To show how dedicated I am to opening up these transparent discussions about women’s fitness and wellness, I will be sharing a personal story about emotional wellness very soon. 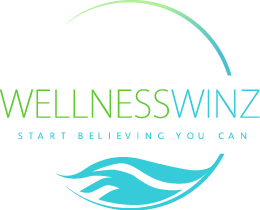 This entry was posted in Wellness and tagged Beauty, emotional wellness, intellectual wellness, Mind/Body, occupational wellness, physical wellness, self-awareness, self-help, social wellness, spiritual wellness, Wellness, women's health, Work/Life Balance on March 9, 2015 by wellnesswinz.